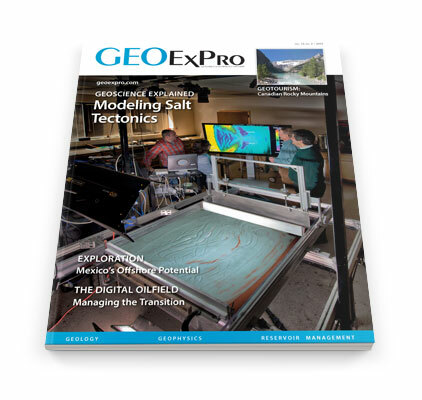 This edition of GEO ExPro Magazine focuses on North America and the Digital Oilfield. 50 Industry Issues: Invest or Panic? Why and when do we need to use consultants? Philip Angell, Managing Director of Dubai-based consulting firm Vision Project Services DMCC, explains. What is a Digital Oil Field? Something of a ‘buzz’ phrase – but what do we mean by ‘the Digital Oil Field’? For more than ten years, Norway has attracted small- and intermediate-sized companies because of favourable geological and fiscal conditions. An uplift in the tax system may now reduce the majors’ interest in the Barents Sea. Australian-based Searcher Seismic and Chinese BGP consolidate their relationship. Recent discoveries indicate the potential of the Sud Profond Offshore Senegal Region. Time to Invest or to Panic? As everyone knows, the oil price has plummeted in recent months. Spiraling ever downwards alongside it has been the value of E&P stocks and shares – but is this correlation justified? Is it a good time to invest in exploration? Ian Davison, Eoin O’Beirne, Theodore Faull and Ian Steel, Earthmoves Ltd.
An insight into some highlights of the offshore hydrocarbon potential available in almost virgin exploration territory. On a dream – and a bit too close to her garden – the old wooden derrick was skidded to its third location on Mrs. Daisy Bradford’s 970 acre, East Texas farm… this would be the one. Mud logging is vital for rig safety and gives the first indication of the potential success of a well, but its role is not well known or understood, especially by people outside drilling operations. Life on the oil industry rollercoaster! Winners and losers as the oil price slump continues. Detailed salt modeling has unraveled the development of a mystifying collection of structures that are a key element in the eastern Gulf of Mexico petroleum system. Dazzling Dallas rose up from the north Texas plains as a technical and financial center for the oil industry following the 1930 discovery of the supergiant East Texas oil field. Ultrahigh resolution 3D seismic methods not only bridge the gap in continuity between the shallow subsurface and seafloor, but also the gap in communication between geoscientists and engineers. Mfon Udofia, Shell’s Exploration Manager for Algeria, gives us a few insights into the role and the skills and experience it requires. Dr Julian Pickering, Samit Sengupta and Barnaby Annan, Geologix Systems Integration Ltd.
Why has people transition proved so difficult in oil and gas projects? The Canadian Rocky Mountains rise majestically from the interior plains of Alberta, and the mechanisms which formed them are well illustrated on the scenic drive from Calgary to Banff and Lake Louise. A frontier environment with conventional resources, where exploration risk is low, execution risk is manageable and the plays are world-class.